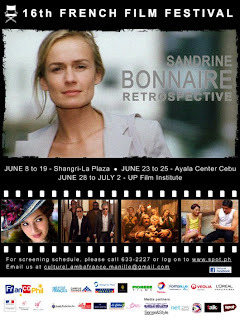 Girl Kuripot Girl Kuripot: Watch Free French Films! After my CineEuropa marathon last year, I had a whole new appreciation for foreign films. I caught a glimpse of the exciting culture of the ever-so-loyal movie buddies I met over that 5-day adventure. Now, the focus is on French films! Watching movies will definitely take you there without having to leave your seats. The 16th French Film Festival in the Philippines will run from until June 19, 2011 in Shangri-La Mall, in Cebu from June 23 to 25 and finally at the UP Film Institute from June 28 to July 2! Visit Boy Kuripot's link for the synopsis!